As most people know, when traveling abroad native Taiwanese people carry passports which identify them as citizens of the "Republic of China." These passports are issued by the Ministry of Foreign Affairs in Taipei, Taiwan. The Ministry of Foreign Affairs in Taipei is an agency of the Republic of China (ROC) government. Up to the end of the 1940's, the capital of the ROC government was in Nanjing, China, but in December of 1949 it moved to Taipei, Taiwan. As of Jan. 1, 1979, the United States de-recognized the ROC as the legal government of China, recognizing the People's Republic of China (PRC), founded in Beijing on Oct. 1, 1949, in its place. In other words, at the present time, the US does not maintain diplomatic relations with the ROC regime on Taiwan. Under US law, the legal significance of the word "passport" is defined in the Immigration and Naturalization Act (INA) of the United States. Reference: INA 101(a)(30) The term "passport" means any travel document issued by competent authority showing the bearer's origin, identity, and nationality if any, which is valid for the admission of the bearer into a foreign country. Under established INA procedures, State Dept. determinations as to what agency is or is not a competent authority to issue a "passport" do not involve any considerations regarding whether the United States has given "official diplomatic recognition" to the regime in question. Additionally, there may be additional political considerations in evaluating the legality or legitimacy of some issuing agencies' passports in the world today. However, according to the Senate ratified San Francisco Peace Treaty (SFPT) of 1952, the situation of Taiwan is very clear -- there is no way that the Republic of China's Ministry of Foreign Affairs can be construed as the competent authority for issuing passports to native Taiwanese persons under the Immigration and Naturalization Act of the United States, as specified in INA 101(a)(30). Although the State Dept. frequently says that the totality of United States policy on Taiwan is contained in the Taiwan Relations Act, the three joint PRC-USA communiques, the One China Policy, and Executive Order No. 13104 of Aug. 15, 1996, this is incorrect. The SFPT is of a higher legal weight than any of these documents. Before we discuss the contents of this important treaty, we need to overview some of the history of the last 125 years. Taiwan had been ceded to Japan in 1895 Treaty of Shimonoseki. Hence after 1895, Taiwan was Japanese territory. In early August of 1945, the United States dropped two atomic bombs on Japan, and the Emperor announced his acceptance of an unconditional surrender. In General Order No. 1 of Sept. 2, 1945, General MacArthur directed Chiang Kai-shek of the ROC to go to the Japanese territory of Taiwan and accept the surrender of Japanese troops. However, under the customary laws of warfare, recognized by all civilized states since the end of the Napoleonic era and codified in the Hague Conventions of (1907), accepting the surrender of Japanese troops didn't mean that Taiwan suddenly became ROC territory, because transfers of the sovereignty of territory must be specified in a treaty. To put this another way, MacArthur's order did not give the ROC the authority to annex Taiwan and to institute mass naturalizations of all native Taiwanese people as ROC citizens. According to international law, the significance of the Japanese surrender ceremonies was only to mark the beginning of the military occupation of Taiwan. Military occupation does not transfer sovereignty. Taiwan was Japanese territory up until April 28, 1952, when Japan renounced the sovereignty in the post war treaty. But this treaty did not award the sovereignty of Taiwan to Chiang Kai-shek's ROC. Article 2b of the SFPT specified: Japan renounces all right, title and claim to Formosa and the Pescadores. No "receiving country" was specified for this territorial cession. Hence, upon the coming into force of the post-war peace treaty, the status of Taiwan was "undetermined," it didn't belong to the ROC. That was the recognition of the forty eight nations who signed the SFPT. What about the United States' position on this issue? Some scholars hold that the ROC - USA Mutual Defense Treaty (MDT) of 1955 effectively changed the US government's position on the Taiwan sovereignty issue. These scholars claim that the MDT recognized ROC sovereignty over Taiwan. The US Senate never agreed to such an interpretation however. In conjunction with the ratification of the 1955 MDT, a report issued Feb. 8, 1955 by the US Senate's Committee on Foreign Relations specified: "It is the view of the committee that the coming into force of the present treaty will not modify or affect the existing legal status of Formosa and the Pescadores." To avoid any possibility of misunderstanding on this aspect of the treaty, the committee decided it would be useful to include in this report the following statement: It is the understanding of the Senate that nothing in the treaty shall be construed as affecting or modifying the legal status or sovereignty of the territories to which it applies. But what was the "legal status or sovereignty of the territories" to which the MDT applied? As stated above, in the SFPT of 1952, Japan renounced the sovereignty of Taiwan, but this sovereignty was not awarded to the ROC. The status of Taiwan remained as "undetermined," which means that the ROC was only recognized as having "effective territorial control" over Taiwan, not sovereignty. Obviously the ROC on Taiwan cannot be considered a sovereign nation if it is not holding clear "legal title" to Taiwan territory. If Taiwan territory does not belong to the ROC, then there is no legal basis to consider native Taiwanese people as ROC citizens, and no legal authority for the ROC Ministry of Foreign Affairs to issue ROC passports to native Taiwanese people. By ignoring the specifications of the SFPT and the implications of the INA in their analysis of the Taiwan question, the officials of the State Dept. have completely hoodwinked the international community, and the members of Congress, for over 55 years. So, in the final analysis, why does the State Dept. continue to accept ROC passports as valid travel documents? Of course the answer is "The China Lobby." On November 8, 2007, nineteen members of the US House of Representatives led by Congressman Scott Garrett (R-NJ) introduced a resolution supporting UN membership for the Taiwan and its 23 million people. The resolution concluded that it is the sense of Congress that Taiwan deserves full membership in the United Nations under the name "Taiwan." Obviously, membership in the United Nations is only open to sovereign states. In the present day, is Taiwan a sovereign state? Significantly, there is nothing in the ROC Constitution to support the contention that the national title (i.e. Republic of China) may be officially abbreviated to "Taiwan," moreover there is no record of the Taiwanese people having ever founded a "Republic of Taiwan." So, technically speaking, "Taiwan" is a geographic term, and not the name of a state. However, for the sake of argument, let's accept the premise that the Taiwanese people, under the jurisdiction of the ROC, are allowed to call their "country" whatever they want. Based on such a premise, we then have to show that at the minimum, the ROC has a government, a permanent population, a defined territory, and the capacity to enter into relations with other states. These are the minimum requirements for "sovereignty," as specified in the Montevideo Convention of 1934. On the surface, the ROC appears to meet these criteria, however former Secretary of State Colin Powell maintained otherwise. On Oct. 25, 2004, Mr. Powell stated that "Taiwan does not enjoy sovereignty as a nation." In order to delve into the legal logic behind Mr. Powell's remarks, it is helpful to do an overview of the last 125 years of history, as we have done above. Our conclusion must be as follows: Whether considered from the standpoint of US constitutional law or international law, Mr. Powell's analysis is 100% correct. Unfortunately, Mr. Powell forgot to explain why the State Dept. has continued to accept ROC passports as valid travel documents. Importantly, if any of the members of Congress would spend some time reading the 1952 Senate-ratified SFPT, they would soon realize that Resolutions on supporting UN membership for Taiwan are a total waste of time. Taiwan is not a sovereign state, and it is not part of the ROC either. Moreover, for the Taiwanese to be carrying ROC passports is totally without legal basis. What Passports (or "Travel Documents") Should the Taiwanese Be Carrying? With this background information out of the way, there is still a need for some concluding remarks to explain exactly what passports the native Taiwanese people should be carrying. To delve into this topic, it is necessary to understand that passports are issued based on the concept of "allegiance." Under the customary laws of warfare, upon the surrender of Japanese troops the local populace in Taiwan will pass under a "temporary allegiance" to the conqueror, which in the post-Napoleonic era will be the principal occupying power. Moreover, the doctrine of "temporary allegiance" only exists in a single-tiered formulation. The historical record clearly shows that all military attacks against Taiwan in the WWII period were conducted by United States military forces. Hence, the United States was the "conqueror" of Taiwan, not the Republic of China. In General Order No. 1, General MacArthur gave directions to Chiang Kai-shek of the Republic of China to accept the surrender of Japanese troops in Taiwan. The Generalissimo accepted these orders. The surrender ceremonies mark the beginning of the belligerent occupation. The United States is the "conqueror" and "the principal occupying power." Under international law, the Republic of China military forces are merely "a subordinate occupying power" under the USA. The ROC officials have consistently maintained that the sovereignty of Taiwan was transferred to the ROC on the date of the Japanese surrender ceremonies in Taipei: Oct. 25, 1945. They then base all of their "legal logic" on this incorrect legal premise. Looking at the actual details of the nationality determination, although there were some proclamations made in the Fall of 1945, the most commonly quoted reference for the "legal basis" of native Taiwanese persons as having ROC nationality is a Jan. 12, 1946, order issued by the ROC military authorities. Surprisingly however, that order was never ratified by the Legislative Yuan, nor made into a law. Importantly, as "belligerent occupation" of Taiwan began on October 25, 1945, with the surrender of Japanese troops, and only ended with the coming into force of the SFPT on April 28, 1952, such an order is prohibited under international law. More specifically, the imposition of mass-naturalization procedures over the civilian population in occupied Taiwan territory is a war crime. Reference to the pronouncements of the US government, the British government, etc. in the late 1940's (and even into the 1950's) confirms that the leading Allied nations never recognized the legal validity of the mass naturalization of native Taiwanese persons as "ROC citizens" by the Chiang Kai-shek regime in the 1940's. International law clearly specifies that military occupation does not transfer sovereignty. The proclamation of "Taiwan Retrocession Day" on Oct. 25, 1945, thus indicating a clear intention and objective to annex Taiwan territory, is a war crime. Notably, Article 4 of the ROC Constitution specifies that "The territory of the Republic of China within its existing national boundaries shall not be altered except by a resolution of the National Assembly." In regard to the alleged incorporation of Taiwan into Chinese territory, there is no resolution of the National Assembly on record. Examination of Article 26 of the SFPT exposes further problems. This Article serves to authorize the drafting of a peace treaty between the ROC and Japan. Article 10 of the Sino-Japanese Peace Treaty (Treaty of Taipei) of August 5, 1952 specifies: "For the purposes of the present Treaty, nationals of the Republic of China shall be deemed to include all the inhabitants and former inhabitants of Taiwan (Formosa) and Penghu (the Pescadores) and their descendents who are of the Chinese nationality in accordance with the laws and regulations which have been or may hereafter be enforced by the Republic of China in Taiwan (Formosa) and Penghu (the Pescadores)...."
Looking at the legal record, the ROC Nationality Law was originally promulgated in February 1929, when Taiwan was a part of Japan. It was revised in February 2000, however there were no Articles addressing the mass naturalization of Taiwanese persons as ROC citizens. Hence, the conditions of Article 10 of the Sino-Japanese Peace Treaty in regard to "in accordance with the laws and regulations which have been or may hereafter be enforced by the Republic of China in Taiwan...." have yet to be fulfilled. Japanese Courts have held that the native persons of "Formosa and the Pescadores" were of Japanese nationality until the early Spring of 1952. In the SFPT, Japan renounced the sovereignty of Taiwan, but the ROC was not the recipient of this sovereignty. This is stated in Article 2b and confirmed in Article 21. Hence, according to the provisions of the SFPT, the ROC is not the legal government of Taiwan. In summary, for native Taiwanese persons to be bona fide ROC citizens, two conditions would need to be met. First, the SFPT would have to award sovereignty of Taiwan to the ROC. Second, there would have to be a law passed regarding these mass-naturalization procedures, after the peace treaty came into effect on April 28, 1952. As clarified above, neither of these two conditions has been met. 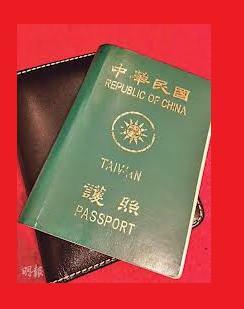 With no clear legal basis to include "Formosa and the Pescadores" (aka Taiwan) in its definition of "national territory," and no international treaty references which can be found, it is extremely questionable to say that the ROC Ministry of Foreign Affairs is the "competent authority" to issue passports to Taiwanese persons. Unfortunately, the US State Dept. has been deliberately hiding the true facts of Taiwan's international legal status from the American public and members of Congress for over 55 years. It is time to set the record straight. The Taiwanese people are entitled to their rightful place under the US Constitution. As a first step, the State Dept. should de-list ROC passports as valid travel documents for entrance into any of the fifty states or US insular areas.